The clean, modern lines of this four-piece sectional group with a right-facing chaise will quickly become the heart of your living room. 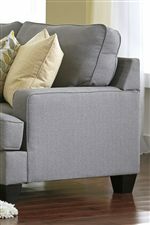 Track arms and plush back cushions, and reversible seat cushions with welt trim are perfect for contemporary living. The chaise sectional piece adds cozy seating to your sectional where you can stretch out. Three square pillows with a buttercup grid fabric and three with a colorful plant motif include feather inserts and hidden zippers to add softness to your sectional. The Chamberly - Alloy Modern 4-Piece Sectional Sofa with Right Chaise & Reversible Seat Cushions by Signature Design by Ashley at Walker's Furniture in the Spokane, Kennewick, Tri-Cities, Wenatchee, Coeur D’Alene, Yakima, Walla Walla, Umatilla, Moses Lake area. Product availability may vary. Contact us for the most current availability on this product.